We have been through a couple of clotheslines. The problem was that they were not sunk in concrete, so they eventually fell over. They were the typical two stranded long line. I asked for one of those clothesline tree deals for Valentines (Paul and I are so romantic that way). It took a few weeks but we finally got a sunny, mild day so I could try it out. I love not having to waste electricity using the dryer, even though it is a little more time consuming for me. There's something peaceful, though, about hanging up clothes in the sun. You can see my garden (with its rickety old shed)in the background....just waiting for a bunch of seeds! Readers, do you hang your clothes out to dry? You need one of those clotheslines like in Amish country where there is a mast like a telephone pole with a pulley at the top. It really looks like the women are sending messages to each other by how the different clothes are placed on the wire. Our old poles were in concrete and still leaned toward each other so I am growing kiwi on them now. In my last two houses I just did not have a good place to hang outside. So I hang some in the basement. Seemingly drying clothes outside is really good for them. The sunlight can kill microbes on sheets, etc. I love your new clothesline. I have fond memories of helping mother pin her clothes on the line when I was young. I would like to wish you and your family a very blessed Easter weekend. I used to but we need a new clothesline ourselves. Love your 'hills and hollers'! Best Valentine ever! I want to bring my laundry to your house. I love sleeping on sheets dried in the sun! I will see if I can find my clothespin apron for you. It was Granny Besse's. Clothes on the line reminds me of home! I love drying clothes in the sun, love the fresh smell of freshly sun dried clothes. 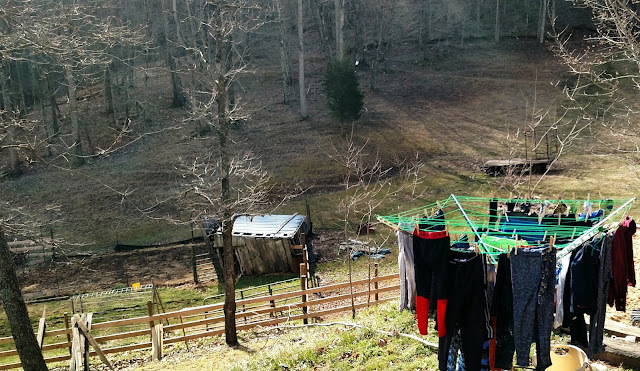 Those Amish clotheslines can be nice, but I'm not that organized about hanging my wash...I'd want the item that I put on first, and wouldn't be able to reach it! My mother had one like that when I was little. Believe it or not, but it is against subdivision rules for us to have a clothes line. I haven't had one since I was a child. This is great!!! I've always wanted a clothesline like your new one! but mama does not like to.. So sometimes things happen both ways,,,, . But there is no clothes lines,, We just use the railings on the porch. We use the clothesline here every chance we get. keeps our smaller house much cooler in the Summer not using the dryer too. We have a reeled one to use between the house and the shop and I put one of those spinning ones like yours up last year too. The women folk then complained it was a bit too high so I had to make em a step stool for it. I LOVE sheets out to dry. I hang them out before work and bring them in when I get home. It's glorious. You know, there are suburbs where you are not allowed to hang your clothes out to dry. Can you imagine?? I have the clothesline poles my grandfather welded for my mom. They are sunk in with concrete and will likely survive a nuclear attack. I love them and use them half the year (Wisconsin, you know). That looks awesome! I hang dry half of our clothing. I just have lines strung through our basement laundry room! I used to put them out to dry, but my line broke. I thought about my allergies - maybe I shouldn't have them out to dry with pollen particles blowing into them. I hang out clothes whenever I can. Everyday when I am not at school. Sheets, pillowcases, and blankets are the best. Everything ends up smelling so good. Even today, my Mom insists that hanging clothes out to dry resulted in fresher clothes! No, I did for many years but then moved into a place that did not allow clotheslines. I've moved since then but now we have very hard water and I find the dryer helps soften the clothes. My grandmother used to hang her bath towels out on a clothes line in the morning after using them, so they could dry before she put them in her hamper. That was if she wasn't planning on washing towels for a couple days. Understandably, she'd want them dry before putting them in the hamper - nobody wants mildewy items in the hamper! She would also hang white items out for a few hours during the daytime so the sun would hit them and brighten them (or on that rare occasion, to help "bleach" out an accidental stain). I love hanging up clothes really early in the morning, it's so calming makes you feel like you've accomplished something.